Nokia Android phone – Normandy – leaked by Evleaks , again, Nokia Normandy, a smartphone from Nokia running Android was leaked by Evleaks. Though we’re pretty afraid about the future of this phone whether it will ever be a reality or not. The UI of the phone looks clearly very customized with the blend of two OS: Meego and Symbian. Its a beautifully blended UI that many people may like to use. 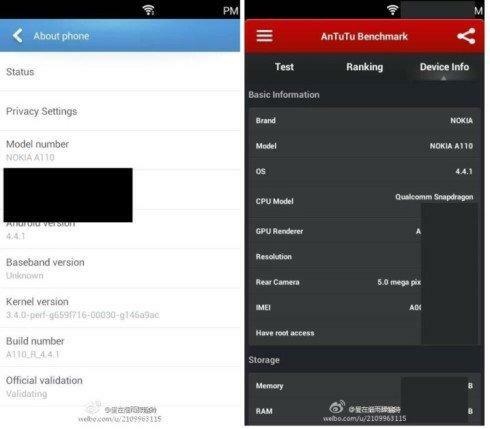 From the Antutu Benchmark app, it can be quite easily understand that it will be a dual sim 4 inch screen smartphone running Android and it has been codenamed as A110, quite a similar naming to Micromax handsets. It is having a 5 megapixel snapper and powered by Qualcomm Snapdragon processor, which Nokia uses in their Windows phones also. 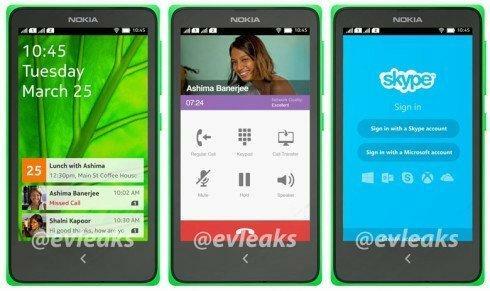 I think it will be quite similar to a mix of Asha 501 and Lumia 520 as far as I can see from the pictures. And from the specifications and dual SIM feature we can guess that the handset might be a special one for Indian market and the benchamark also shows that the handset runs Android 4.4 Kitkat. Pretty nice features have been blended into this one and hope this will come up at the end of this year with at least 512 MB RAM if Nokia really want to turn people’s “Nokia runnig Android” dream to a reality.